The summer heat is getting uncomfortable with those hot and humid days, and we understand that a big, heavy meal is probably the last thing on your mind. Our solution is a light AND healthy salad that helps beat the heat! 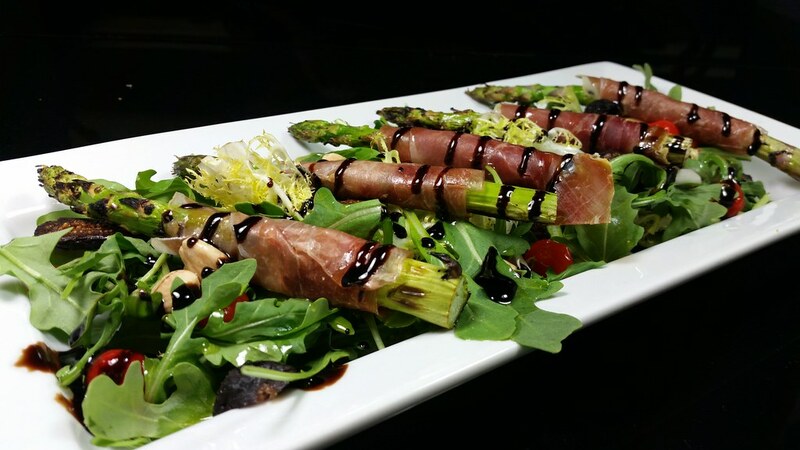 We're serving a prosciutto wrapped grilled asparagus salad. We start by grilling fresh asparagus spears with goat cheese and wrapping them in the dry-cured, thinly sliced ham. The spears are then placed on top of a bed of arugula and frizee (or endive) with olive oil and a balsamic glaze. The salad is finished off with a mix of Spanish marcona almonds, dried figs, and Sweety Drops sprinkled on top. Sweety Drops are a small, tear-shaped pepper that originated in the Peruvian Amazon. Also known as Incan Red Drops, Sweety Drops have a sugar-like sweetness and work well in salads, pizza or pastas... or even in baked goods. Its taste is both sweet and sour. The pepper seed is a combination of a cherry pepper and jalapeno pepper. And while it's not going to be overbearing in the salad, it provides a sweet contrast to the peppery and stronger tastes of the arugula and frizee. The thinly-sliced prosciutto provides a savory and salty comparison to the sweet balsamic dressing. Paired perfectly with a glass of chilled white wine, this dish is the perfect way to spend a hot and muggy summer day!